Fig.1 Grab from a BBC Horizon programme on the brain. 2014. The courses I’ve done with FutureLearn over the last 18 months. 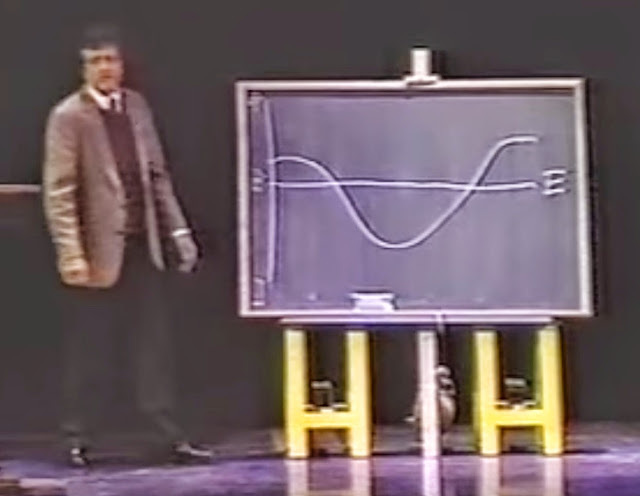 Kurt Vonnegut’s wanted to write an MA thesis on the common shapes of stories: he was told it was too simple. He can be found in various interviews and presentations waxing lyrical about the shape stories take. His are: 1) Cinderella: needs no elaboration. Applies to incremental steps of progress, radical failure then absolute glory. 2) Boy Meets Girl similar: we know it. Applies to any story of desire for something, its loss, then recovery. Also rom-com territory. 3) Man in a Whole: things go bad, then you get out of your whole. Shawshank Redemption. Martian. Haruki Murakami wrote a novel in which the protagonist was really down a well much of the time. I feel I’m most inclined to relate to and to write this one. 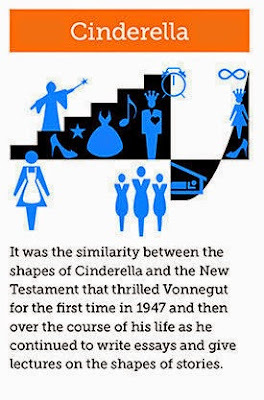 4) New Testament: like Cinderella–gifted things, which are then taken away before being returned with interest. 5) Old Testament: gifted things that are taken away forever. 7) From Bad to Worse: And it never gets better. Says it all. Fallen. 8) Which Way Is Up: That ambiguity in life where we don’t know what is good or bad from actions and events. Probably the hardest to sustain. Hamlet. Of far better use is TV Tropes, which is a cross-media analysis of story types, with examples and links to the authors. I continue to wonder what impact FutureLearn will have on future models for e-learning platforms. I turn screengrabs into aide memoires like the one above. Comments on the ‘Start Writing Fiction’ threads are now down from 3000 per thread to a few hundred … a fall out of 95% is usual for a myriad of reasons. It’ll be interesting to find out how many make it to the end … and in due course who ends up a published author, and most especially how many migrate from a FREE MOOC to a paid-for course with The OU. I have a sense that most on the module are over 60 and broke. We’ve just listened to a handful of authors talking about the importance of reading. I found this insightful and helpful across the board. I relate to Louis de Bernieres in terms of reading habits – different authors, same approach entering and re-entering writing/reading modes in months … something I need to change i.e. write, edit and read a daily pattern. Patricia Duncker says she read and views everything – a philosophy of Francois Truffaut who I was a fan of, especially trashy novels in his case. And from Alex Garner I see the value of seeing a novel as a screenplay, even as a director setting scenes, something incidentally Hilary Mantel talks about in an OU / BBC interview – write in scenes. Succinct. No messing. It relates to her understanding of how we reader in the 21st century – that we are used to and know the snappiness of the movie and TV. She says that the lengthy descriptions of Victorian novels are no longer palatable. I take from this that we have far too great a vivid view of the world. We know what slums, jungles and places globally look like. We see through time in documentaries, and film and now online. You mention the mud of Passchendaele and most people can picture it from commonly shared photographs and documentaries. 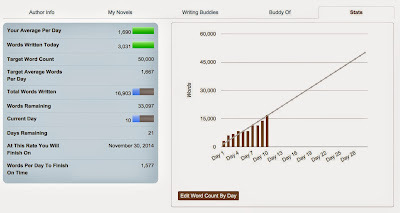 An editing exercise reduced 500 words to 50. Most novice writers grossly overwrite. This OU MOOC favours pithy craft. Not blogging, not on Facebook, but first thing I write, or plan writing. Then get down anything between 500 and 3000 words. 500 words can be a better day, these are good words. As an OU student we are guided through our learning on our Student Homepage. These are like railway tracks, or climbing down a ladder. Whilst you can tick off your progress, it is not being measured. I wonder if a tool such as the above would be handy for preparing a lengthy assignment, say from 4000 words up? Something that you need to build up over a few weeks? It is ‘Start Writing Fiction’, an OU FutureLearn MOOC that sees me using ‘Write a novel in a month’ to complement the course. This makes the MOOC more closely applied to the current task (amongst several). Of all the FutureLearn MOOCs I have done, this, I am sure, must bring students to The OU to do the degree course in ‘Creative Writing’. It has weight, there is gravitas and a clear expertise in distance and online learning that is lacking in many others. ‘Start Writing Fiction’ on FutureLearn courtesy of The OU is brilliant: I have no doubt thousands will sign up for a BA. Meanwhile I’ve taken the hint about the value of ‘peripheral detail’ to offer in a line what no paragraphs of description can do. Several hours ago I had in mind a person as a character and began to describe their face. It all came down to their teeth. This is drawing on a teenage crush of mine and I find images and drawings to back up my idea then plunge through some weighty papers, not least, courtesy of The OU Library, a research paper on the incidence of something called ‘dental agenesis’ or ‘retention of baby teeth’ (which might be just one or two), to ‘oligontontia’ which means the rare retention of many baby teeth (0.14%) due probably to inheritance, reduction in the size and form of teeth, or reduction in the size and shape of the ‘alveolar process’ (the thickness of the bon retaining the teeth). This will do for me, though coming away with one word, ‘retruded’ which may describe the teeth, but still fails to capture what I want to say. Teeth are either smaller, retained baby teeth, or because of the retrusion they appear smaller. Kirsten Dunst shows a touch of this prior to orthodentic treatment. 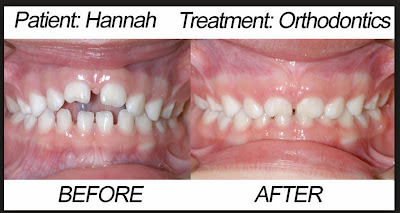 Orthodentists prefer to adjust the way baby teeth appear in an adult mouth rather than removing them. It depends on how many there are. One is not rare (36%). The look on the person is of a smaller jaw, the teeth like a row of pegs, the smile of a 9 year old … though, as I have found, you wouldn’t know it. It is genetic, clusters have be found in Sweden. It can be caused by trauma and illness in childhood. I am left wondering why one character is studying the mouth of another which such precision. Polder B J, van’t H of M A, Van der Linden F P, Kuijpers-Jagtman A M. A meta analysis of the prevalence of dental agenesis of permanent teeth. Community Dent Oral Epidemiol 2004; 32: 217–226. As exercises in ‘getting the writing juices going’ for an OU FutureLearn MOOC on ‘Start Writing Fiction’ I felt that this exercise was immediately doomed to fail. I’d put on the radio and have a familar presenter, talking about familar topic in a familiar way and feel about as inspired as realising that I’ve always used white Abdrex toilet paper. It didn’t work out that way at all. On an iPad I went to BBC iPlayer which was fatal; I’d followed national news on our local town exploding effigies as part of our celebrations of 5th November (Lewes) and listened to Alex Salmond making gross false assumptions on the people of this town who he erroneously cobbled in with all of East Sussex, not even that, but that percentage of the population and subsequent councillors who are Conservatives forgetting as he always does that in any population there is a spread of views – anyway, this just makes me feel that they have his character spot in so this Spitting Image caricature deserves the infamy. I then watched Film 2014 on the latest movie releases before finally clicking to the radio and realising what a cheat this was because I could select the programme. FiveLive Extra caught my eye, because I never listen to it, but there is a lot of talking. So I opened that, only to curse because sports news has just started and that bores me even more than politics but I decided I had to trust The OU tutors and go along with this exercise anyway : that was nearly 90 minutes ago. A player in … was it tennis or rugby or football, does it matter? 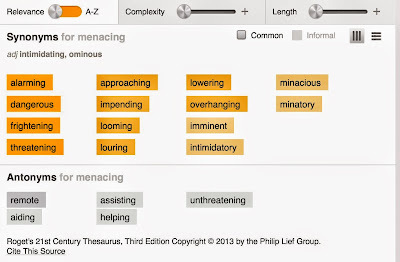 The player was described as ‘menacing’. At first I couldn’t see how a current or new character would ever be ‘menacing’ so I tried the antonym: ‘remote’, ‘unthreatening’ – which describes one of my lead characters perfectly. What would make him ‘menacing’ though? This cracked open his mind and early life experiences like magic and I have been tapping away on my iPad ever since as if my left hand is doing an impersonation of Michael Flately across the glassy QWERTY keyboard. 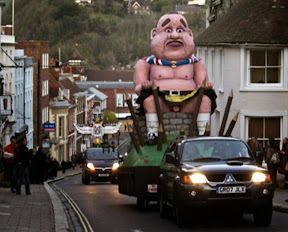 Is that someone who has been a Lewes Bonfire Society effigy? P.S. If the radio is on, then turn it off and count to TEN, or switch to another channel. Then jot down the first thing that is said. I’m running with the results for the rest of the evening so its achieved beautifully at what it aimed to do. A really magic course, so yes, if I hadn’t so much other OU baggage I’d be signing up to the creative writing BA programme. One for the wish list if I can ever save up enough. Studying with the OU for the last four years it soon become natural to conduct online niche searches for books and papers related to course work. You learn also how to tag, store and gather the information and ideas that you find: this is one answer to that, a blog that serves several purposes, not least as a learning journal and e-portfolio. Searching for the obscure, that essential detail that forms such a vital part of the sensory palette used by the writer, is as easy to find and just as necessary. This morning I stepped out one May evening in 1917 and wanted some hint of what I’d see, hear and feel: a few searches and I can see a waxing moon at 10.00pm on a cooling evening as the temperature dips below 12 degree C, and the noise, in this instance of thousands of men in Nissen huts around a camp soon giving way to a robin trilling and burbling in the trees and the sound of the sea washing against the Channel Coast. These details are far more than accessories that overlay character and plot; they are what gives it credibility. Writing on and as the Great War rages requires significant care. The wrong detail will throw a reader, worse I’ll end up in a conversation about my claims. Posting a piece of fiction some years ago an irate reader told me what I’d said was rot and went on to correct me – I had been writing fiction. I’d said that a character called Gustav Hemmel changed his name to George Hepple and fakes his own death – the reality is that he went missing over the English Channel in his plane. THREE HOURS working on writing fiction, five days a week, is the goal . The OU will have me for TWO hours a day (averaged with longer stints at the weekend). That’s the plan. A) What is the research trying to find out; what questions is it trying to answer? B) How will the proposed research answer the questions? My interest and participation in blogging is obvious. I am exploring other subjects to research, but inevitably come back to this. There are fields where blogging works, and others where it does not. 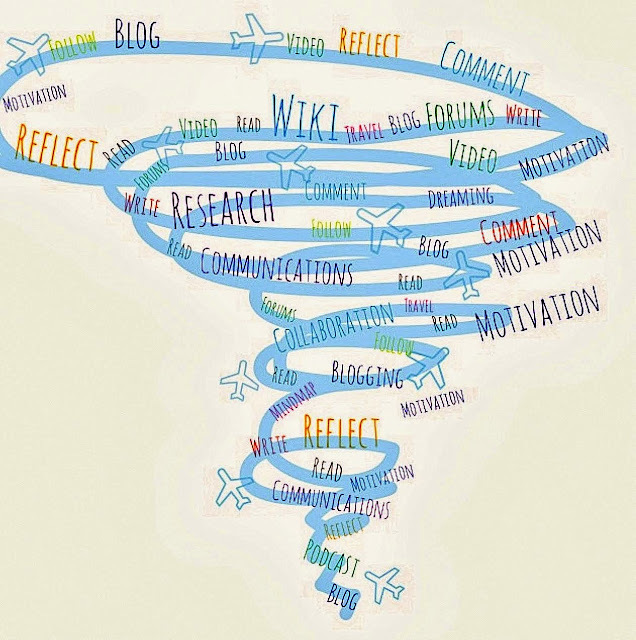 Do you think that students who keep a blog learn more? Retain more? And so get more from their undergraduate studies? Are certain subjects more appropriate for this where writing and digital literacies are being developed? creative writing and even postgraduate research? What role do these play in personal and professional writing?What if it is made compulsory, a graded component of all or part of a module you are taking? What about those in the visual arts such as designers and art directors, who create concept boards for development purposes, or for architects and fashion designers, as well as in the performing arts such as actors and directors? Might those following vocational subjects such as medicine or law set in train a way to enhance a life of learning? Could blogs be peer graded successfully? What benefits do you get from reading or contributing to another persons blog? Is it less a blog and more of a publication when others contribute and the ‘blog’ carries advertising and is available to read only through subscription? What do we learn by thinking of the origins of blogging as keeping a diary, log or journal, such as the private diary, journey log in a yacht, or writers journal? Is it just electronic paper? Another way to gather your thoughts and ideas? When is a blog an e- portfolio? What does it reveal about the person if the blog is shared? Are like-minds attracted to each other? What are the copyright and other legal issues? How honest or revealing should one be? Are the concerns about exposure and disclosure valid? When does truth turn into fiction and does it matter if the reader cannot tell and isn’t told? What is the perspective behind the research? What is the role of theory? What is the prestructured versus unfolding research? What is the relevant literature? Could blogging be seen as a scholarly activity? March 1, 2013 2:39 pm / 3 Comments on Could blogging be seen as a scholarly activity? about devising the research question(s) and method of research. This quote from Axcel Bruns is wrong in relation to blogging. Fig.2. An excerpt from my own early blog. I was reading blogs in 1998, did some Dreamweaver training and if I’d got my head around FTP uploads I may have been up an away in 98 rather than 99 when I heard of Diaryland and joined the platform soon after it started. Over the next 4 to 5 years I saw a massive growth and influx of what by modern terms would have been described as journals, creative writing, fantasy, role play and social networking. I question why bloggers are defined by the institution they are at – the blog is more personal, like the noticeboard at someone’s desk in the bedroom or study, or a diary or journal they carry about with them, whether electronic or paper. Fig. 5. We should stop seeing blogging in isolation – forms of ‘keeping a journa’, for whatever purposes, is as old a writing itself. Little is ever mention of a history of keeping diaries, a writer’s journal or other kind of daily record for reflection or in scholarly circles to record the iterative process of a learning journey or a piece of research. John Evelyn was a diarist. Was he scholarly? What about Pepy’s he was keeping an historic record? For whom did Lady Anne Clifford keep a diary if not for an historic, even a legal record, of her rights to her father’s estates? (Lady Anne Clifford kept at a diary late 1500s into the 17th century). Was Virginia Woolf using herself as the subject of an internal discussion? What did Anais Nin learn and share about her writing as well as her personal journey, a journey that was shared with Henry Miller and that a couple of decades was taken by the filmmaker Francois Truffaut. As someone who had kept a diary since he was thirteen and had been typing it up and putting on disc for nearly a decade, the move to the web was a natural one. a space for reflection, to seek peer support, or both (e.g. Kerawalla et al. 2008). I read blogs and corresponded with writers who were using the format to try out chapters of fantasy novels, to share poetry, to test webdesigns even to meet and indulge in intimate chat, role play and even cybersex. (Early blogs were the forerunners of a lot to come). Whilst some of this activity isn’t within the parameters of ‘scholarly’ practice, certainly from a creative writing point of view self-publishing was. From personal experience there were those exploring their personality, who were lonely, depressed or bi-polar. Most studies in English speaking countries … yet it was presumably going on elsewhere. And where does someone who is using writing in English in a blog to learn English stand in terms of being a student and a scholar? Boyer (1990) developed a conceptual framework which defines ‘‘scholarship’’ as a combination of teaching and research activities. In particular, he suggests four dimensions to define scholarship: discovery, integration, application and teaching. The earliest bloggers played a teaching role, for example Claire Z Warnes set up a series of web pages to encourage and support young writers in 1998. She was teaching, they were exploring through reading, writing and sharing just as if they were meeting face to face in a classroom. Boyer’s dimensions constitute an appropriate starting point for researching digital scholarship (Weller 2011). embracing the open values, ideology and potential of technologies born of peer-to-peer networking wiki ways of working in order to benefit both the academy and society. Which is exactly what Claire Z Warnes (1998) was doing, indeed, as some remaining posts that can be viewed show, it was as if she were becoming the Dean of one of the first online creative writing classes. ‘We have found that blogs seem to occupy an intermediate space among established writing forms such as peer-reviewed academic papers, newspaper articles, diaries, blurring the private public and formal informal divide ‘. (Heap and Minocha 2011). There is a growing awareness of blogging as a writing or communicative genre in academia and research and as a new form of scholarship (e.g. Halavais 2007). to enable sharing information without time lags involved in formal publications. The next steps in our research (according to the authors of this paper) are to validate the effectiveness of the framework (they developed) as a thinking tool about digital scholarship, and for guiding the practice of blogging in academia and research.